The Lone Ranger was riding high in 1981 thanks to a popular Saturday morning Cartoon series (by my favourite company Filmation) and the promise of a big budget film (that didn't work out so good). So, Gabriel Toys blasted the toy shelves with two distinct toy lines, a relaunch of their popular 1970s 9" Toy line and a 3 3/4" line so you could have Tonto get a sasparilla in the Creature Cantina! 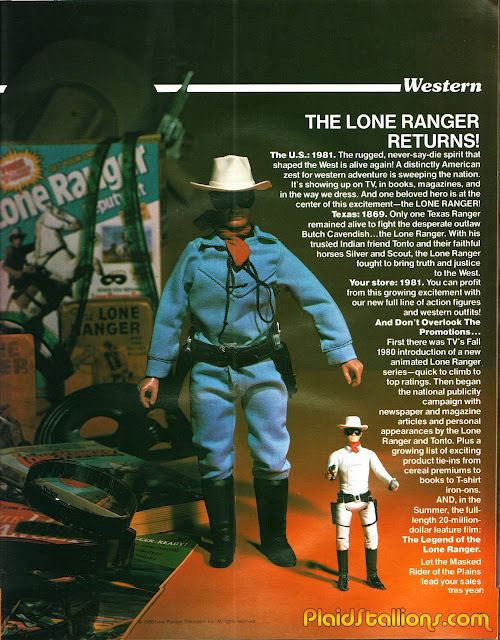 Visit THE 1981 Gabriel Toys Lone Ranger Catalog here! ...and in spite of the terrific detailing on the 9" line, it's easy money the 3 3/4" line outsold them five to one for just that reason. If the figures sold that much at all. Butch even got a plug in the original Star Wars Kenner catalog on the last page. Maybe this anon is wrong, but I don't think Western-themed toys have ever been a huge hit again in the post-Star Wars era -even when paired with a sci-fi theme. BraveStarr came and went without any lasting impact. The Galaxy Rangers (based on an incredibly well-animated cartoon show) had even less notice. It's a shame, really. George Lucas created a cultural juggernaut that mindlessly kicked aside a bunch of great toy lines. The gun and holster set in this catalog looks a lot like the one I got for my birthday in 1972, so I suspect that was another toy they dug out of the vault for another run. Even in the early 70s, Western toys were not a favorite of mine, preferring cops & robbers or secret agent themes. I can only imagine how little kids in the 80s cared about Western stuff in the wake of Star Wars. 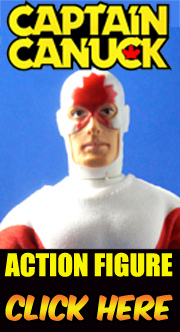 I had the big figures when I was really little, but the when 3 3/4 figures came out I wanted them but no one ever got them for me... you know 70s adult logic, "you already have a Lone Ranger! You're not getting another one!" I vividly remember the TV spot for these. One line of the song mentioned a covered wagon, but at the time I thought they said "cupboard wagon," which confused me much longer than it should have.